The gruesome death of an Egyptian pharaoh who lived 3600 years ago has been described by researchers, who believe he may well have been on horseback when attacked by warriors on foot wielding battle-axes. The patterns of wounds to King Woseribre Senebkay’s body suggest he was attacked while in an elevated position relative to his assailants, quite possibly mounted on horseback, the researchers reported. He succumbed to 18 axe blows. Another surprising result of bone analysis is that muscle attachments on Senebkay’s femurs and pelvis indicate he spent a significant amount of his adult life as a horse rider. Another king’s body discovered this year in a tomb close to that of Senebkay also shows evidence of extensive horse riding, suggesting the kings of what is known as the Second Intermediate Period at Abydos were accomplished horsemen. The researchers report that Senebkay and other royal remains at Abydos provide valuable new insights into the early introduction of the horse to Egypt. Although use of horseback riding in warfare was not common until after the Bronze Age, the Egyptians appeared to have been mastering the use of horses during the Second Intermediate Period. Horseback riding may have played a growing role in military movements during this era, even before the full advent of chariot technology in Egypt, which occurred slightly later, at the beginning of Egypt’s New Kingdom around 3550 years ago. The findings make Senebkay the earliest known pharaoh to have died in battle. Last year, the tomb of king Senebkay, who born about 3650 years ago, was discovered at Abydos by researchers from the University of Pennsylvania Museum working in association with Egypt’s Ministry of Antiquities. Now the team, led by the museum’s Dr Josef Wegner, has completed a detailed study of Senebkay’s skeleton, as well as the remains of several other kings whose tombs were discovered nearby. “Forensic analysis has provided some new answers about the life, and death, of this ancient Egyptian king, while raising a host of new questions about both Senebkay, and the Second Intermediate Period of which he was a part,” Wegner said. Detailed analysis by Dr Maria Rosado and Dr Jane Hill, of New Jersey’s Rowan University, identified an extensive array of wounds on Senebkay’s skeleton showing he died at the age of 35 to 40 from a vicious assault by multiple assailants. The king’s skeleton has an astounding 18 wounds that penetrated to the bone. The trauma includes major cuts to his feet, ankles, knees, hands, and lower back. Three major blows to Senebkay’s skull preserve the distinctive size and curvature of battle axes used during Egypt’s Second Intermediate Period. The evidence indicates the king died violently during a military confrontation, or in an ambush. The researchers suspect the death of Senebkay in battle appears to have taken place at considerable distance from his burial place at Abydos. 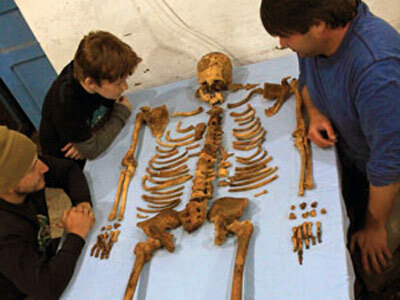 The king’s body shows that significant time elapsed between his death and the preparation of his body for burial. What remains a mystery is where the king died and who Senebkay’s opponents were. Possibly the king died in battle fighting against the Hyksos kings who at that time ruled northern Egypt from their capital at Avaris in the Nile Delta. However, Senebkay may have died in struggles against enemies in the south of Egypt. Historical records dating to Senebkay’s lifetime record at least one attempted invasion of Upper Egypt by a large military force from Nubia to the south. Alternatively, Senebkay may have had other political opponents, possibly kings based at Thebes. The tombs of seven other kings have now been excavated at Abydos, opening a new window into one of Ancient Egypt’s most obscure periods. It appears probable that Senebkay and these other rulers formed a short-lived dynasty and chose Abydos as their burial ground. It is hoped that the continued excavations by the Penn Museum researchers in collaboration with the National Geographic Society will shed more light on Senebkay and the other kings buried near him.